Evolving from client needs, piping object analysis users get access to rich new set of measurement functions. Users calculate overall or segment lengths, shortest distance, even fractions into x/y/z direction. Piping objects are used in MCAD for designing vehicles, ships and machinery as well as production at offshore plants as well as in the Building Information Modeling (BIM) in regards to prefabrication. 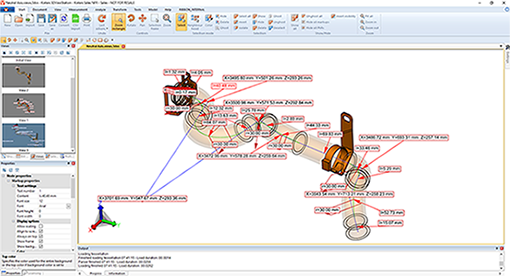 Depending on responsibilities, users perform different review processes and inspections of CAD data. As piping objects vary from other solids and faces, users must have access to specialized tools and analysis options. 3DViewStation’s standard functionality supports these processes by loading native or pre-translated CAD files and giving users the ability to isolate and inspect sub-assemblies. In addition, it allows for various measurements, dimensions, sections and annotations. Results of these processes can be organized into views for later use and easy retrieval. These operations can be easily performed using Desktop or WebViewer version. Some of these functionalities are also available in the Virtual Reality VR-Edition. Known for its modern user-interface, high performance viewing, advanced analysis and integration capabilities into leading systems, 3DViewStation features current and mature importers for a broad range of 3D and 2D formats including i.e. Catia, NX, Creo, SolidWorks, SolidEdge, Inventor, JT, 3D-PDF, STEP, DWG, DXF, DWF, MS Office and more.